Welcome to the 101st Oregon SHAPE Conference Registration! Join us on October 10th, 2015 to learn the latest and the best in teaching strategies, ideas, and professional development in the health and physical education field. The conference will be held at Pacific University in Forest Grove, Oregon. We have two exciting keynote speakers, amazing featured presenters, and a variety of sessions for you to attend! You can pre-register for the conference below. We will be posting the conference agenda, keynote speaker details, hotel information and much more in the weeks to come, so please keep checking in. 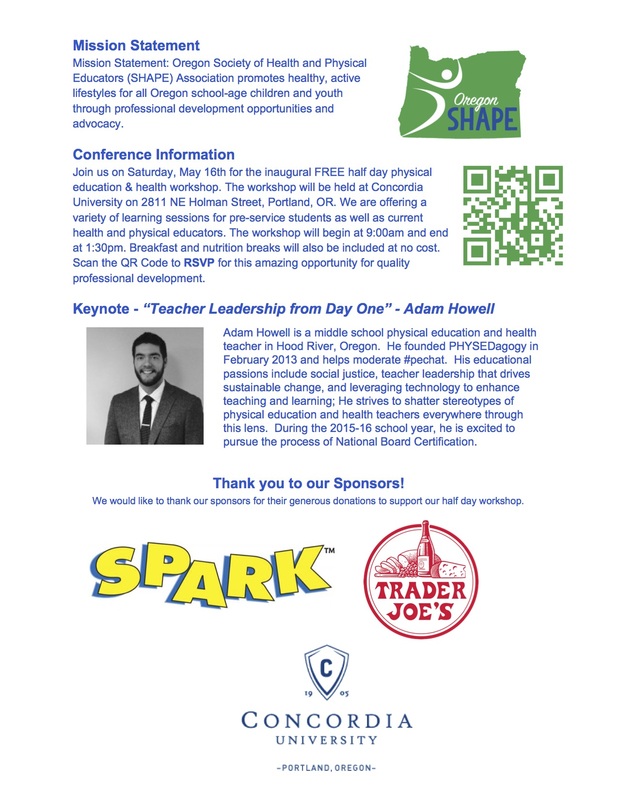 We are excited for this opportunity to bring amazing professional development to all the health and physical educators for the great state of Oregon. We look forward to seeing you at the conference! As an additional opportunity, if you are interested in bringing a building principal or district superintendent, please contact our Oregon SHAPE Executive Director, Mindy Drake for additional details at oregonshape@gmail.com. 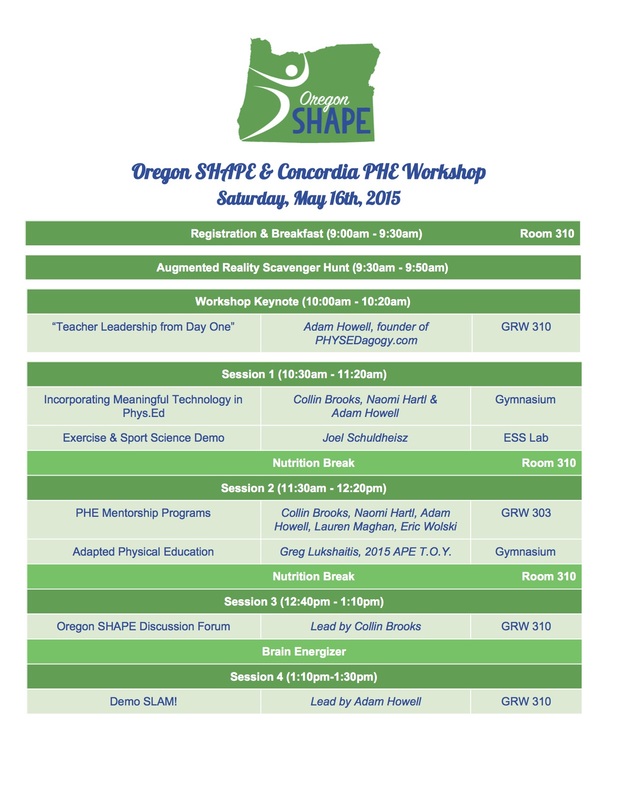 We are so excited for the Oregon SHAPE Workshop tomorrow at Concordia University! We look forward to seeing you there. Here is the latest information with our updated schedule. If you are looking for a place to park check out the map here. When you come into the George R. White Library (GRW) you will be directed to the registration table on the third floor. Here you can sign in and grab a schedule. Breakfast will be located in room 310, and is provided complimentary to each attendee. After breakfast you will have the opportunity to fire up your brain by participating in an Augmented Reality Scavenger Hunt! We will help you get set up for this at the registration table and show you where to go. The keynote will start at 10:00am in GRW 310, followed by sessions. A polite reminder that while breakfast and snacks will be provided and ample, lunch will be on your own. Hi everyone! This Saturday is Oregon SHAPE’s free workshop. If you haven’t signed up please do so by clicking the RSVP icon. This should be a great time to recharge the teaching batteries at the end of the school year. We plan on having some great sessions centered around teacher leadership, integrating meaningful technology in physical education, mentorship and more. Also, Greg Lukshaitis, the Adapted Physical Education Teacher of the Year, will be teaching an awesome adapted session. Below is the schedule. Join us at 9:00am for a complimentary breakfast. Below is the schedule for the workshop. Click it to get a printable copy. We would like to thank our sponsors for their generous donations to support our half day workshop! Join us on Saturday, May 16th for the inaugural half day physical education & health workshop at Concordia University. The address is 2811 NE Holman Street, Portland Or, 97203. We will be offering a variety of learning sessions for pre-service students as well as current health and physical educators. The workshop will begin at 9:00 and end at 1:00. Breakfast and a nutrition break will also be included at no cost. The main emphasis will be on physical education leadership but there will a variety of sessions on incorporating technology into the physical education classroom, pre-service sessions on classroom management, health education and more. RSVP here for this great and free opportunity for quality professional development. We will be sending an email out to all participants with a schedule soon. Check out the video preview below. 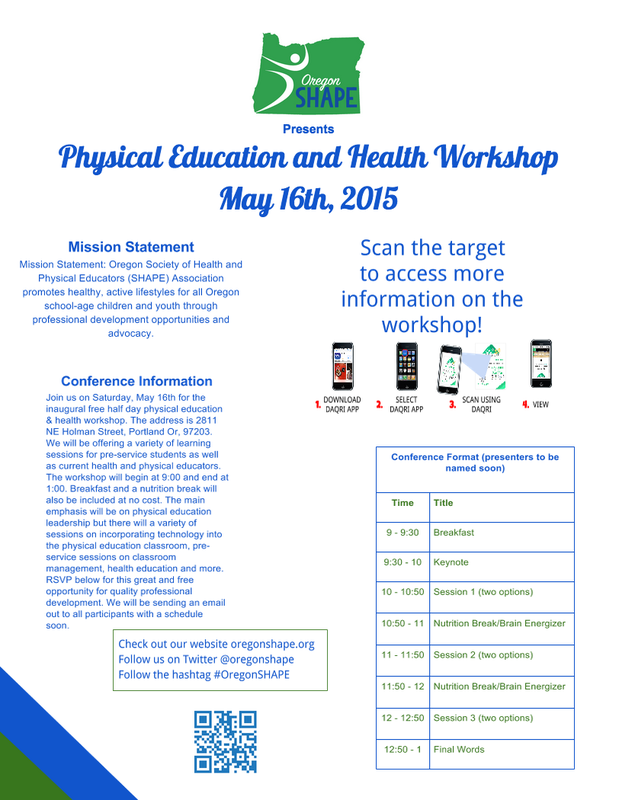 Here is the latest eNews from Oregon SHAPE! Included are some great free resources for you and fellow physical educator colleagues. Also included is an introduction from the new Board of Director secretary Naomi Hartl. There is a lot of the horizon for Oregon SHAPE! Check out the eNews and let me know if you have any questions. Here is the October edition of Oregon SHAPE eNews! Find out more about an online professional development oppertunity specific for Physical Educators called the PhysEd Summit. The 2014 Oregon SHAPE conference was a huge success. Thanks to everyone who was a part of it. A special thanks to the Oregon SHAPE Board of Directors for putting on a great conference. Specifically, thanks to Dawn (past president) for securing Linfield College as our location for the conference, as well as for putting in countless hours in the evenings leading up to the conference. Also, thanks to Mindy (Executive Director) who put much time and effort into registration, shirt design and many other small details that made the conference such a success. Furthermore, thank you to every vendor that made the trip to the Oregon SHAPE conference. Amanda Stanec did a wonderful job of presenting her keynote address on “Spinning a Web of Physical Literacy”. We were so fortunate to hear her moving and motivating address. Here is a link to all the conference handouts. Let me know if any are missing, and I will personally contact the presenter to retrieve the handout. Here is a link to a conference survey. Please take a few minutes to let us know what you liked, as well as what we can do better to serve you, our members. Thanks so much for attending the 2014 Oregon conference! 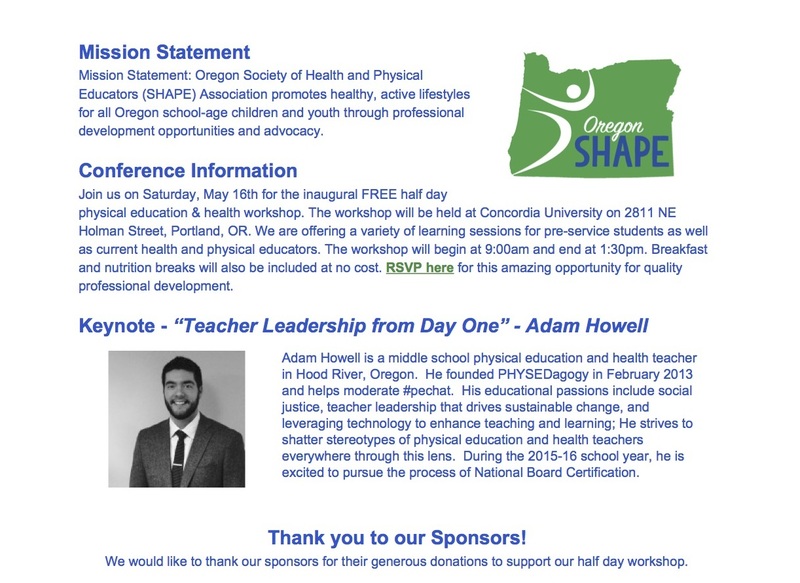 I am very excited to lead Oregon SHAPE and to continue to create meaning professional development opportunities, advocate for our profession and communicate regularly with Oregon SHAPE members.